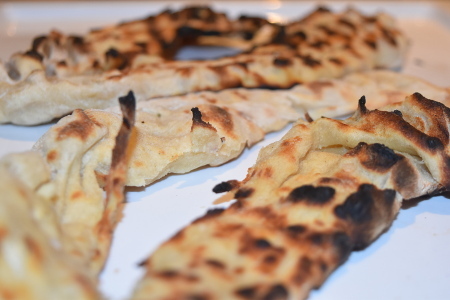 This delicious recipe for barbecued flatbreads was inspired by my good friend Sinéad; to every party without fail she brings a homemade garlic and rosemary focaccia and sticks it in the oven when everyone gets a bit peckish. Of course, the entire thing is devoured within five minutes. It’s simple, but truly amazing - especially after a couple of G&Ts. It’s such a party favourite that I pestered Sinéad for the recipe, and then I began to think – how could we do this on a barbecue? So voilà, the garlic and rosemary flatbread. Cooked so quickly that it’s the perfect party food snack. I also thought I’d take the opportunity to try out another flavour, so I’ve included sundried tomato and olive as an alternative. 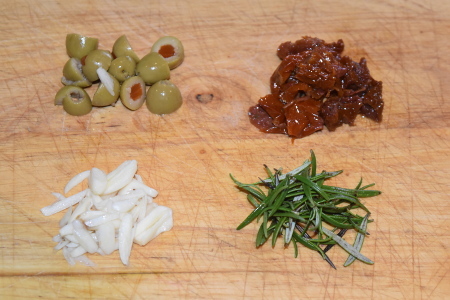 The amounts of garlic, rosemary, sundried tomatoes and olives that I’ve suggested aren’t exact – you can put as much or as little in as you want in, depending on the intensity of the flavour you’re looking for. When we first tried out these flatbreads, we dipped them in some leftover tomato sauce from pasta the night before; what a treat that was. Barbecued flatbreads are also good dipped in Vegan Garlic Mayonnaise – assuming you’re not worried about having garlic breath! Makes about five barbecued flatbreads. Prep time, 1 hour 15 minutes. Cooking time, less than 5 minutes. Allergens: Gluten (strong bread flour). Pour the flour out onto a clean work surface and create a well in the middle. Make sure the walls of flour are consistent (with no gaps!) all the way around the well so that no water can seep out. At this point, use your hands to push in the remaining flour and combine until you have a not-too-sticky ball of dough. Of course, if the dough is really sticky then go ahead and add more flour, whereas if the dough feels dry and isn’t sticking together, add a touch more water. Knead the dough for a good few minutes, until it’s stretchy and smooth. You’re doing it right if you’re working up a sweat! 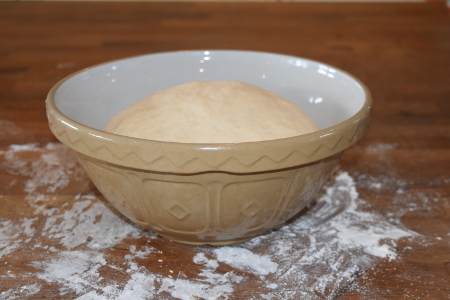 Pop the ball of dough into a large bowl and cover with cling film, before putting it in a warm place to prove. I use the plate warming drawer of my oven which seems to work well enough. Leave it for at least half an hour, until doubled in size. Tear off chunks of dough and roll out into ovals onto a floured surface. If you’re not too worried about them being evenly sized, go ahead and use your hands to spread out the dough – either way the dough needs to be about half a centimetre to a centimetre thick. As you’re nearly ready to cook, make sure your coals are hot. If cooking on a barbecue with a lid, get the internal temperature up to about 180-200°C (356°-392F). 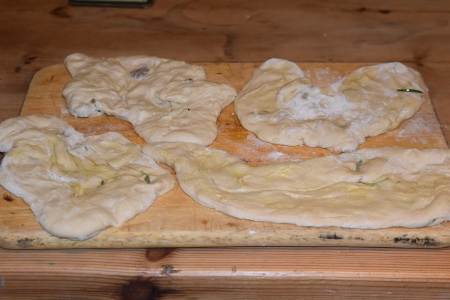 Take whichever flavouring you wish, and spread out a few pieces/leaves across one side of your flatbread. I recommend about one garlic clove and a few rosemary leaves or one sundried tomato and a couple of olives per flatbread. Fold the plain side of the flatbread over onto the flavoured side, and squish down the edges, sealing the flavourings in. If the bread is looking a bit thick, just use your hands to pull, squash and thin out the dough. Give the top and bottom a brush with some olive oil, and sprinkle on a bit of sea salt. 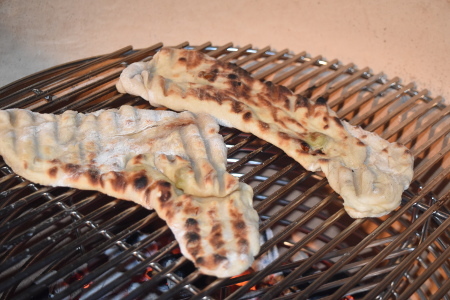 Put the flatbreads directly onto the grill, and cook them for 2-3 minutes on each side. Keep a close eye on them otherwise they will burn! Garnish your barbecued flatbreads with sea salt crystals and more olive oil if desired, and serve with whatever sauce you like. Enjoy!